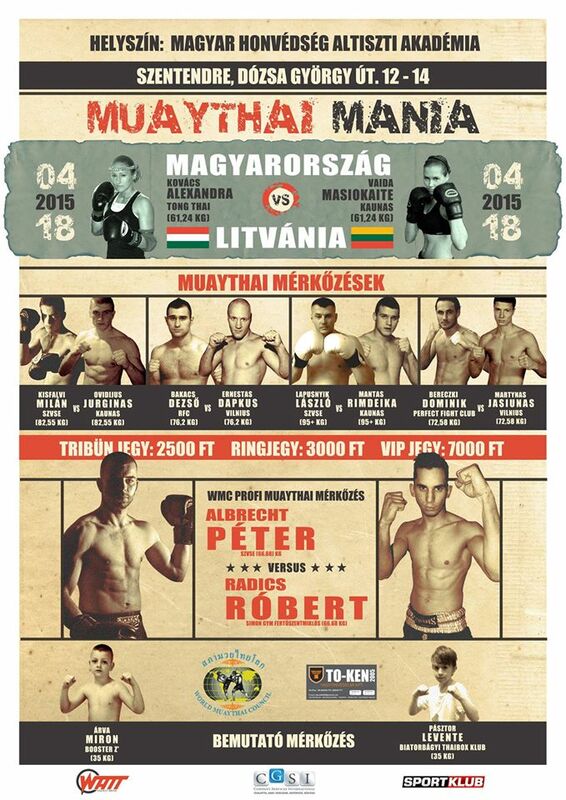 Muaythai Mania has been able to hold another successful event in Hungary, Muaythai Mania 8: Hungary vs Lithuania. The arena at at Szentendre, Hungary was sold out and filled to the brim with spectators from both Hungary and Lithuania showing up to support their respective fighters and athletes. The event was opened with a demo junior bout to showcase the younger generation of Muaythai athletes from both countries, followed by the 4 Pro-Amateur fights featuring Hungarian and Lithuanian fighters as well as the WMC Professional fight between the two Hungarian superstars. The event was hosted by the Szentendre Military Academy, with support from the local mayor’s office, sponsored by To-Ken, and televised by local TV network, Sport Klub. The Embassy of Lithuania and H.E. the Ambassador herself attended the event, to show support for the Lithuanian team. The first bout was a female fight in the 61.24kg division, between Kovács Alexandra (Hungary) and Vaida Masiokaite (Lithuania). Both ladies put on a strong performance and it was Hungary’s Alexandra that won the split decision from a close fight. The second fight was between local superstar Kisfalvi Milán (Hungary) and Ovidijus Jurginas (Lithuania) in the 82.55 kg division. This was the Lithuanian fighter’s professional debut and he put up a great fight, but was unable to win against the more experienced Hungarian, Kisfalvi, who took the decision at the end. The third bout was between the 2014 Hungarian amateur muaythai champion Bereczki Dominik and the 2014 the junior silver medalist of the 2014 IFMA Muaythai World Championship, Martynas Jasiunas, in the 72.58 kg division. After a very technical and highly entertaining fight, where both athletes showed excellent muaythai skills, the judges’ decision went to Martynas from Lithuania. Hungary vs Lithuania now 2:1! The toughest battle of the event was in the following bout between Bakacs Dezső (Hungary) and Ernestas Dapkus (Lithuania) in the 76.2 kg division. After a hard back and forth battle, Ernestas Dapkus from Lithuania was able to win the decision from the judges. After the first four bouts, the Hungary and Lithuania were 2:2, so the stakes were higher, as the deciding fight between the two heavyweight athletes, Lapusnyik László (Hungary) and Mantas Rimdeika (Lithuania). The fight was intense and the crowd came to their feet as Manta from Lithuania was able to stop his opponent in the first round, bringing the score to 2:3, Lithuania. 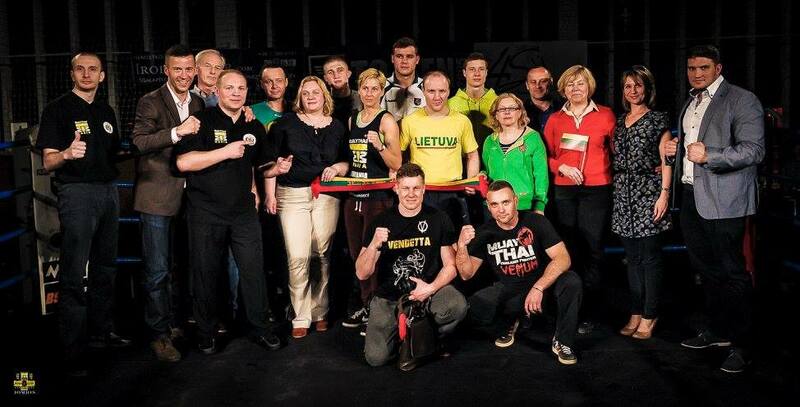 On behalf of the organisers once again a big thank you goes out to the Lithuanian team for making the long trip and giving the spectators such great fights. The next round of events will be scheduled to take place in Vilnius approximately at the end of 2015, which everyone will be looking forward to! After the pro-amateur bouts, the main event of the evening was up in the 66.69kg WMC Professional division. The local favourite Albrecht Péter (Szentendre VSE), 2014 Hungarian amateur champion, verses Radics Róbert (Simon Gym), also a two-time Hungarian muaythai champion. After a hard back and forth battle with Albrecht using his strong clinch game and Radics employing his reach, it was Albrecht that won the entertaining bout in the end. Congratulations to Muaythia Mania for putting on another spectacular show and for continuing to promote and foster the sport and cultural art form of Muaythai. This entry was posted on Monday, April 20th, 2015 at 4:32 PM	and is filed under News.